The morning after the election, coaches from the Chicagoland area came together for the 2nd annual Sports-Based Youth Development Practitioners’ Summit at the Breakthrough FamilyPlex on the west side. This event will take place annually as a social-professional opportunity for program staff to learn about how their work fits into the larger landscape of sports for social change in Chicago, and also learn from their peers to refine their craft. Urban Initiatives hosted the summit, along with Chicago Run and Up2Us. 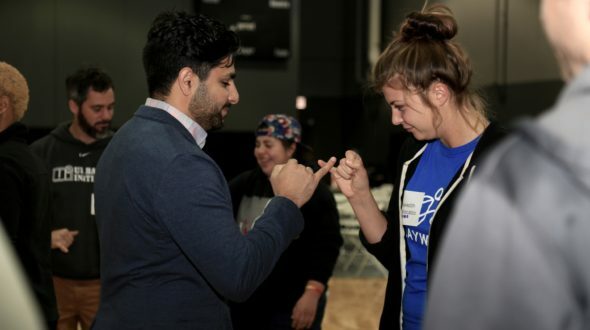 Over 120 people from 10+ organizations including Triple Threat Mentoring, Playworks, and the YMCA attended discussion sessions to share their best practices and challenges with each other, with veteran coaches leading the groups. The open style of this forum allowed participants to be the agenda and dive into discussions around topics that are relevant to them on a daily basis. Over lunch, participants heard from guest speakers Naomy Gran’Pierre and Caitlin Cahow. Naomy participated in the Rio Olympics as the first woman to represent Haiti in swimming. She shared about the life skills she learned in sports as well as the power of a great coach. “Sports give us access,” she said. Sports give kids access to physical health, mental toughness, and valuable life skills that can help them build towards a successful future. Thank you to everyone who helped create this summit!